“Let me finish my Thundermuck,” Arnie bragged, taking a sip of his coffee. “You know, that Thundermuck you are drinking was brewed in Uniontown from beans processed by Columbia River Coffee Roasters, ” I said. 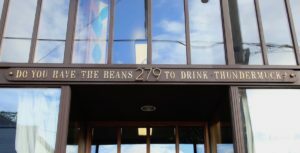 “Thundermuck is coffee of the 20s. 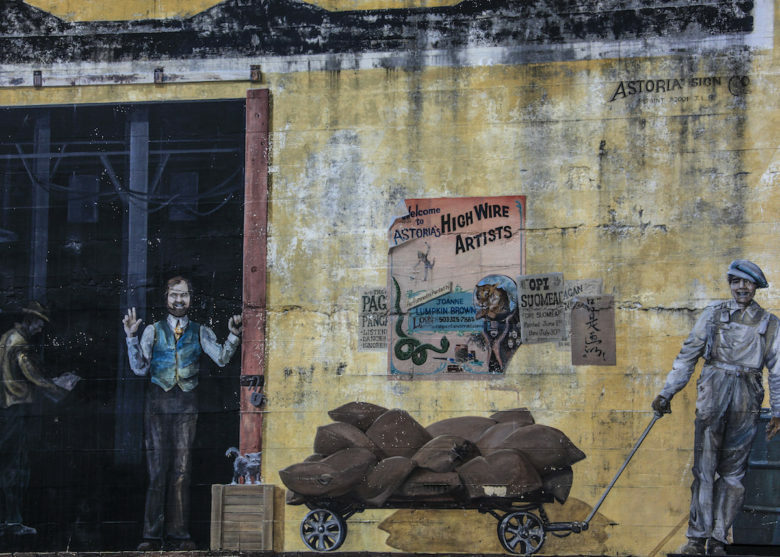 “From what I’ve seen, looks like Astoria is nostalgic about those dear days by gone by, “Arnie returned. Enough speculating . . . we were out the door and after a short walk we were standing at the entrance to one of Astoria’s many piers located here at the mouth of the Columbia,one of the major rivers of the world. 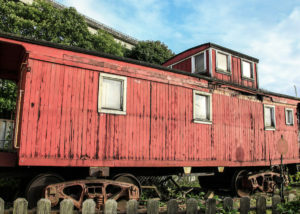 A red caboose caught our eye. Sitting idle, she had finished her work many years ago and seemed now to be waiting for city fathers to decide what to do with her. “Or a tourist information booth,” I contributed ignoring Arnie’s extravagance. A short distance away we passed an aging restaurant. 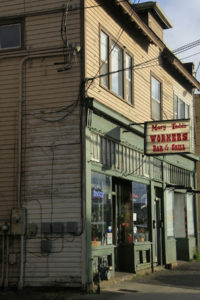 “Mary Todd’s Workers Bar and Grill,” the sign said. The design of the facade and the electric meters on the side told us it was vintage 1920s. It hadn’t changed much. We moved on and soon came across something, I had no idea what it was, resting on the sparse remains of the foundation of what used to be a water-related business. “Probably a reminder to all who see . . . a reminder of the thriving days of yesteryear,” I said wondering with Arnie what it was. “Ah, but we know what this is,” Arnie surmised looking intently at the mural gracing the riverside wall of one of the remaining canneries. We came to a propeller resting on a cement pedestal near the Columbia River Maritime Museum. It was big; taller than Arnie or me. 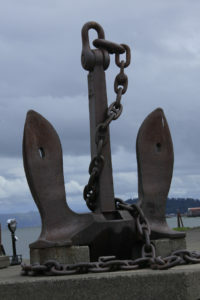 Nearby lay a huge anchor. “Imagine the size of the ship that those came from,” I observed. “Bigger than those tankers?” I said pointing to the ships at anchor in the river. Content with intriguing discoveries of our outing, Arnie and I grabbed the trolley and headed back to the Riverwalk Inn . . . looking all the while for fascinating eye-catchers for our next outing. A couple of days ago I’d seen logs stacked as high as a skyscraper at one of the loading docks . . . maybe that’s next.